Inputting the code is straightforward. However, using the data it provides to advertise strategically requires time and marketing expertise, so many businesses turn to experts such as Hibu, for professional Facebook ad management. Hibu is a highly affordable full-service digital marketing agency offering expert Facebook ad management services for businesses who want to use Facebook Pixel strategically to grow their business. The Facebook Pixel is a powerful Facebook advertising tool that uses a short piece of code that is installed on your websites to track site visitors. The pixel then provides advertisers with information about their visitor’s interactions on their site, such as pages they viewed and any actions they took while there (e.g., add to cart or wish list). The Pixel provides general Facebook advertisers information such as site visits and what visitors are looking for using a site’s search function, and indicates when a new lead has completed any sort of sign-up on your site or completes a registration form. However, ecommerce businesses can also use the Pixel to see when a visitor adds a product to their cart or wish list, starts the checkout process, adds payment information, or completes a purchase. Advertisers can use the Pixel to gauge site visitors’ intent and then create ads specifically tailored to attract a similar audience on Facebook, ensure their brand stays in front of previous visitors, or give warm leads another reason to visit their site. This is called retargeting. For example, AutoTrader, the online platform for finding vehicles for sale, uses the Facebook Pixel to retarget ads. Without the Facebook Pixel, AutoTrader wouldn’t be able to know the interests of a user, but with the Facebook Pixel, they can see which cars people are interested in and at what price point and location. Now, instead of displaying a one-size-fits-all ad to users, they display ads showing the exact vehicles a user had recently searched for. Nearly every advertiser investing ad spend on Facebook Ads should use a Facebook Pixel because it gives them the insights into a user’s behavior and interests, allowing them to be more tactical in their approach to Facebook advertising. This makes ads much more effective, increasing your return on ad spend, and ultimately growing your business. 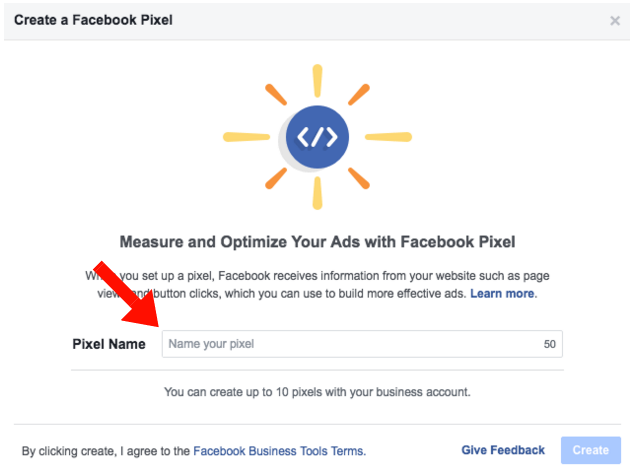 The Facebook Pixel and Pixel Helper are free tools available to all Facebook advertisers. The only caveat is that the code can only be used on Java-enabled sites. Also, you will want to use the Facebook Pixel once your website has traffic. New sites with very little traffic won’t likely see a great return on ad spend (and time). If you have a Java-enabled site with steady traffic, you should use the Facebook Pixel to better attract and engage potential customers. 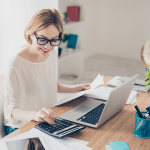 Most businesses will benefit from using the Pixel, and those without the time or experience would be advised to use a professional Facebook ad management service to get the most out of their ad spend. In case you are not sure where to find a Facebook ad management service or are not sure what to look for, we’ve found the Six Best Facebook Ad Management Services. Creating and using a Facebook Pixel is easier than it may sound. You will need to start by going to Facebook where your Pixel will be generated. Once you have the Pixel code, you will embed it into the heading of your website. Start using yours by following our four simple steps. A Facebook Business Page – Every Facebook advertiser is required to have a Facebook Business page. You can learn how to create your page in our Facebook Business Page article. The ability to access your website’s code – You will need to be able to input the code to your site, so you will either need access to your website’s HTML code or have access to the person who does. To begin, you will need to first create a Facebook Pixel from your Facebook Ad Manager account. This will generate the code, which you will then input into your site. Go to business.facebook.com to login into your Facebook Ads Manager account. If you have multiple business accounts, choose the business you are setting up the Facebook Pixel for. From your Ad Manager home screen, click the drop-down options (the three horizontal lines at the upper left-hand side of the top toolbar). Under the “Measure & Report” column, click “Pixels”—the first option under “Events Manager” (as illustrated below). In the center of the screen, you will see a green “Create a Pixel” button. Click that to begin the Pixel creation process. A pop-up will appear where you will be prompted to assign a name to your Pixel. You can setup up to 10 Pixels, so it is advisable to stay organized by naming each Pixel in relation to the segments you are tracking (i.e., specific products or services). Once you have created your Pixel, you will be prompted to input your Pixel code to your website. You will have three options: use an integration (Tag Manager), manually install the code, or forward the code on to your developer or webmaster. Facebook currently integrates the Facebook Pixel code with a number of platforms from Magneto to Wix. 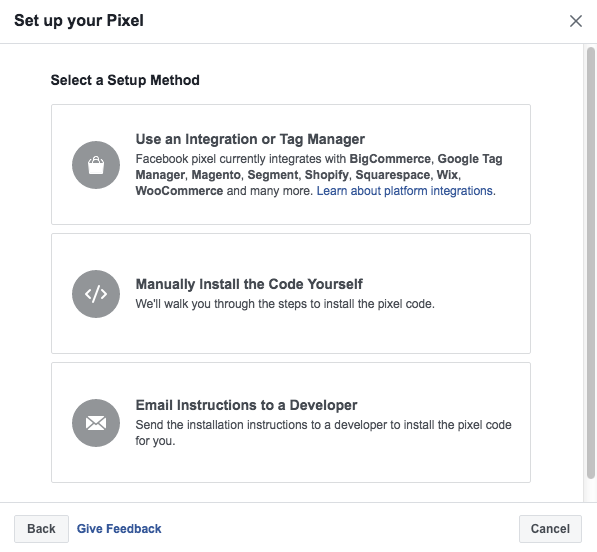 Integrations such as Tag Manager and the Facebook Pixel Helper make inputting your Pixel code an easy process. Get the simple to follow, step-by-step details by reading our article on How to Install and Use the Facebook Pixel Helper. If your website does not currently include Facebook integration, you will need to manually insert the Pixel’s code into your website’s HTML. You will not be able to perform this step unless your website builder and hosting service allows you to customize your website’s templates. You can read more about website builders and hosting services in our article on the Best Website Builders for Small Business. Every website will be different, depending on who built the site and which platform it is built on. Locate your site’s header code, which will appear as <head> within your site’s code. Paste the code below the script between the <head> and </head> codes as shown below. 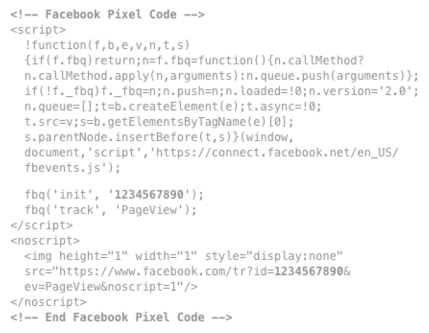 Once you have located your site’s header code, paste the entire Facebook Pixel code below the script between the <head> and </head>. The pasted code should appear as illustrated below. If computer code isn’t a language you speak, you will likely find it worth your time to leave it to the pros to embed your Facebook Pixel. Fiverr is a great platform for finding professional freelancers for task-based work, such as inputting a code, at prices as low as $5. To ensure your Pixel code was input correctly, first check that your code’s status says “active”. You can then also test the code by clicking the “Send Test Traffic” button. The Facebook retargeting Pixel is a useful tool that allows you to advertise to people who have already shown an interest in your business by retargeting ads to them. By knowing who has visited your site, and what they did while on your site, businesses can take a more strategic approach to advertising, and in return, have much more effective ads. The Facebook Pixel provides enhanced conversion tracking, meaning advertisers get more data and information about their users and the performance of their Facebook Ads. This means you can see precisely where your conversions are coming from. For example, you can see if certain campaigns or specific ads are driving more conversions, empowering advertisers to better target ads and ad spend around the best performing areas. The Facebook Pixel helps you get to know more about those visiting and engaging with your website. This information can be used to break out ads to show certain ads to different people, or audiences, on Facebook. More formally, this is referred to as retargeting. By segmenting ads to specific groups of users, ads become more effective and yield more conversions. Without the Facebook Pixel, advertisers would be limited to targeting audiences based on their demographics. The Pixel, however, allows advertisers to know precisely who users are, as well as what they’re interested in, and even maybe to what extent they are interested. This information can be used to create ads tailored to users interested in specific products or services and appeal to those at different stages in the buyer’s decision process. It’s not the information alone from the Facebook retargeting Pixel that makes it so useful—it’s what this level of insight can unveil to businesses and how they can then use it that does. The Pixel provides the information to advertisers, but it’s what an advertiser can do with that information that really matters. Businesses often use Facebook ads to market a current promotion or special. The Facebook Pixel allows the business to focus the ad on those who have previously shown an interest in a certain product or service based on the web pages they visited and their actions on the site, such as adding a product to their cart. 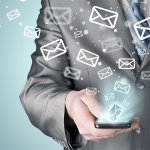 Advertisers can use this information to then pinpoint ads to show to warm audiences. Most businesses have a range of product or service offerings that do not always interest all buyers. For example, a law firm may work in many disciplines of law. It can be assumed that a website visitor who goes to the car accident page has likely been in a car accident and looking to sue for damages. With that, they can tailor the ad copy to speak to that person, making the ad more effective. Online-based businesses, such as ecommerce sites, can gauge a website visitor’s level of intent in the buying process by seeing items a user added to a cart as well as how far through the checkout process they went. 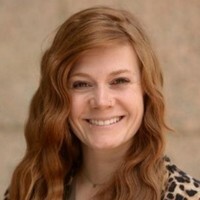 By setting up ads to display to that user of the items they had put in their cart, the business can use reminder advertising to capture abandoned carts and increase sales. A local Bed & Breakfast advertising on Facebook using a Facebook Pixel could see what visitors were doing on their site, from those looking to book a family room over the holidays to those looking at their wedding venue options. With this information, the B&B can then create specific ads for geared towards family vacations for those seeking family rooms, and ads on their wedding services to those looking at their wedding venue facilities. A pet supplies store uses the Facebook Pixel to create audiences by pet type, so people only see ads for the type of pet they have. For example, during an annual holiday sale on flea prevention products, they were able to break out ads to show dog ads to dog owners and cat ads to cat owners. Rather than combining the two, they were able to better speak to those pet owners and see better ad results from the knowledge the Facebook Pixel provided. An online vintage auto parts distributor uses the Facebook Pixel to create a better users experience by targeting ads to those who have viewed certain pages on their site. For example, users who searched the site for 1967 Plymouth Roadrunner would be shown ads for parts that fit a ’67 Roadrunner. The Pixel gives them the understanding of the user’s interests so they know the user wouldn’t be compelled to, say, click an ad for a sale on Fiat 500 parts. How Can I Use the Facebook Pixel Helper? The Facebook Pixel Helper is a simple-to-use tool for troubleshooting and validating the implementation of your new Pixel code. Learn how to use the Facebook Pixel Helper in our article, How to Install & Use the Facebook Pixel Helper. How Do I Find the Best Facebook Ad Management Services? Businesses often find Facebook ad management services by searching Google or asking around. Every management service offers different services at varying prices, so it’s not always easy to find the best option for you. We’ve done the legwork for you and found the Six Best Facebook Ad Management Services. How Do I Find My Facebook Pixels? Under your Facebook Ad Manager homepage, go to the “Pixels” page by clicking the menu icon in the upper left-hand corner of the toolbar under “Event Management”. From there, you will see all of your Pixels, including information on which are active. How Many Facebook Pixels Can I Have? Unless you are a marketing agency managing multiple client accounts under a Facebook Business Manager account, you will only need one Pixel per business. Business Manager accounts can use multiple Pixels, but there can be only one Pixel per ad account. What Are the Best Facebook Ad Targeting Options? There is no shortage of Facebook Ad targeting options from basic demographics (e.g., age, gender, location, etc.) to lifestyle and interests such as political affiliation to the frequency of international travel. To narrow down the otherwise dizzying list of options, we’ve compiled a list of the Top Facebook Ad Targeting Options. All advertisers on Facebook should take advantage of the Facebook Pixel. Every business can utilize the data from the Pixel differently to suit their business and their advertising goals. Ultimately, the Pixel allows advertisers to create better ads, and the better the ad (and its copy, audience, and placement), the higher the conversion rate and the higher the return on ad spend. If the idea of using the Pixel properly sounds daunting or if you simply lack the time it takes to analyze Pixel data and create more strategic ads, it would be a good idea to use a professional Facebook Ad management service. Hibu is a great choice for businesses that want to get the most out of their ad spend by using expert help to manage their accounts. Get started to see how much Hibu can do for your business with professional Facebook ad management.